The Centre has decided to modify flagship rural development schemes like Mahatma Gandhi National Rural Employment Guarantee Act (MNREGA) to suit the needs of naxal-affected districts. While the schemes will be made more flexible, funds allocated to them will also increase. The decision was taken at a day-long consultation held by the Central government with the collectors of 60 districts included under the Integrated Action Plan (IAP). IAP was conceptualised by the planning commission and implemented by the Union Ministry of Home Affairs last year to supplement infrastructure deficit in the naxal-affected districts. 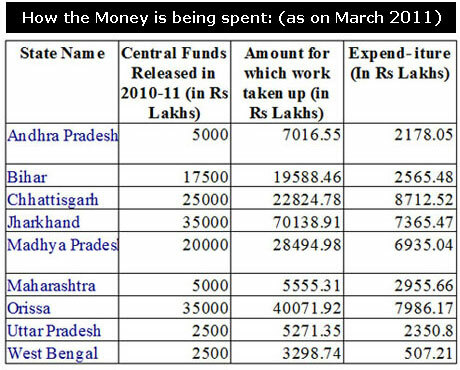 The scheme gave an untied fund (with no prescribed breakup for expenditure) of Rs 25 crore in 2010-11 and Rs 30 crore in 2011-12 to each district for small projects. Stating that road connectivity is a major bottleneck in naxal-affected areas, union minister for rural development, Jairam Ramesh, asked for an additional Rs 35,000 crore to be allocated for these districts under Pradhan Mantri Gram Sadak Yojana (PMGSY). “With the current pace the PMGSY would not be able to achieve its target before 2017-18. We want to connect each habitation in the IAP district within three years,” he said. He also asked the Prime Minister to remove the current rider of minimum 250 people for a habitation to be eligible for PMGSY. On being pointed that contractors in these districts have abandoned the road construction work due to repeated naxal attacks, Ramesh suggested the process of filing tenders be made manual instead of electronic. This will help award work to local contractors, he added. The current IAP will conclude in March next year. Under the existing plan, a committee headed by district collector initiates development projects related to infrastructure, health, education and employment in each of the 60 naxal-affected districts. The committee consists of district forest officer and superintendent of police. There has been opposition to this arrangement. Activists have demanded inclusion of representatives of the panchayati raj institutions in this committee. It was also demanded that the conditions like compliance with the Forest Rights Act of 2006 and the Panchayats (Extension to the Scheduled Areas) Act of 1996 should be applied in the districts to get the next installment under IAP (Read: Include public, fight Naxalites). In the meeting tribal affairs minister Kishore Chandra Deo demanded that instead of a district, a block should be the unit for IAP. “In a district there are many developed regions including the district headquarter. There are chances of money getting spent on regions that are already developed. For money to reach the right place a block should be the unit for the IAP,” he said. The demand has been tentatively approved and the plan may be modified accordingly in the 12th-five-year plan. The states have also been asking that more of their districts be included under IAP. Centre may to increase the number of districts to 78. For the effective implementation of MNREGA, a panchayat development officer and a junior engineer will be appointed in each gram panchayat in the IAP districts. Seventy-five per cent of its cost will be worn by the Centre. Ramesh also announced that all families affected by naxal voilence will be eligible for houses under the Indira Awas Yojana. He also increased the budget for National Rural Drinking Water Programme in the IAP districts from Rs 750 crore to Rs 1,000 crore. All the 60 districts under IAP will now also be covered under National Land Records Modernisation Programme. Currently only 11 districts are covered under the programme which ensures that all the land records are computerised. In addition the ministry will create a network of para-legal institutions in the gram panchayats to resolve land disputes. Under National Rural Livelihoods Mission, service sector jobs will be provided to 3,00,000 unemployed youths, in the next five years. The ministry will also start Public Private Partnership initiatives for value addition in minor forest produce. through involvement of women self help groups. Ramesh also made way for young professionals to take part in the administrative reforms in naxal-hit areas. Called the Pradhan Mantri Rural Development Fellow, the scheme will commence from next year. Three young professionals will be roped in under the scheme for a maximum of three years in each IAP district to assist the collectors in rural development planning. They will be selected through an independent selection process by the ministry. The scheme is inspired by the White House Fellow Programme in the US which has produced many prominent leaders including the current president Barack Obama. Prime Minister Manmohan Singh who was also present at the meet hinted a positive response to Ramesh’s recommendations. “People at the ground level should have freedom to make changes in the schemes according to their needs. They should own, plan and implement the programmes meant for them,” he said.